There are so many Twitter apps available now the iPad. You can do simple things like apps that only post images through a single app. There are quick solutions to check on a single login and there are the super apps that allow you to view multiple accounts and post all kinds of info within your 140. Twitter has become a great source of info about what is happening around the world from the folks on the front lines. What we have noticed missing is a way to have our iPad sitting on our desktop, showing us the tweets from our friends… without having to manually ‘reload’ or scroll. New to us this week is an app called Trickle for Twitter looking to fill that niche need. Load the app, point it at your account and watch it out of the corner of your eye while you work to keep up on the latest breaking tweets. The tweets flow in from right to left on their own. If you think you missed something or want to jump ahead, a swipe of your finger on the screen scrolls you through what Trickle for Twitter has picked up. Placing your finger anywhere else on the screen brings up additional information on the twitter post and the ‘i’ button appears for access to the settings area. 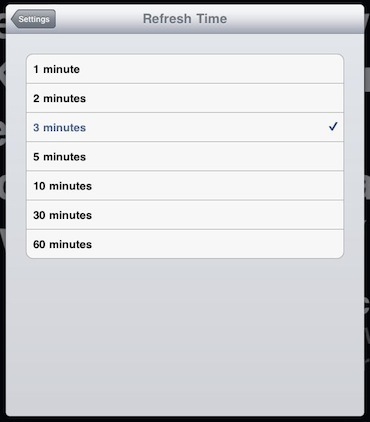 From the settings area, you can set up multiple accounts. Since the tweet feeds will be mixed, the fine tuning effects all accts being checked. 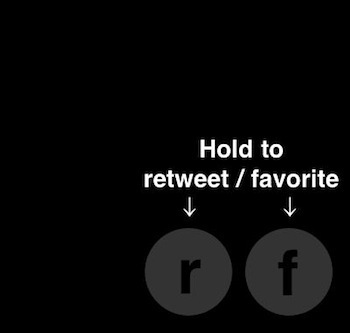 You can lock how buttons display on the screen, if you want the view angle locked and how often Trickle for Twitter should look to Twitter. 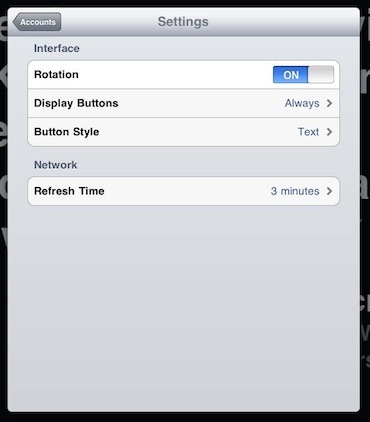 It doesn’t make sense for your iPad to be constantly pinging Twitter for updates. You wouldn’t make Twitter or your network folks happy. So, Trickle for Twitter offers how often you want the app to reach out and grab what’s new. It then fills the time to the next grab showing you what it found. For a casual day, a few minutes between update requests if fine, but if there is something going on you want to keep updated on you may want to shorten the time. 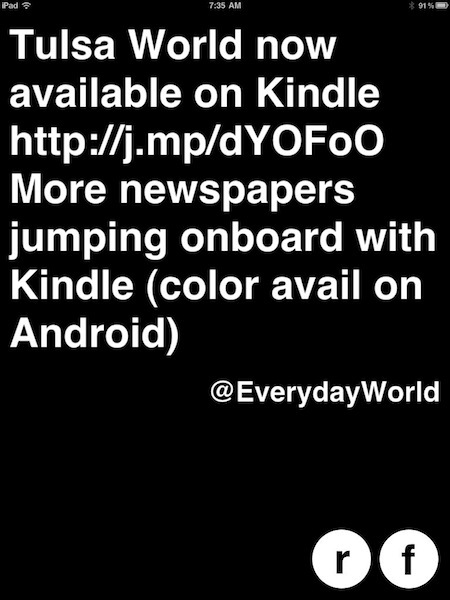 The ‘big’ negative for Trickle for Twitter is that the current version doesn’t support launching of a link in a tweet. Taping on a link does nothing. 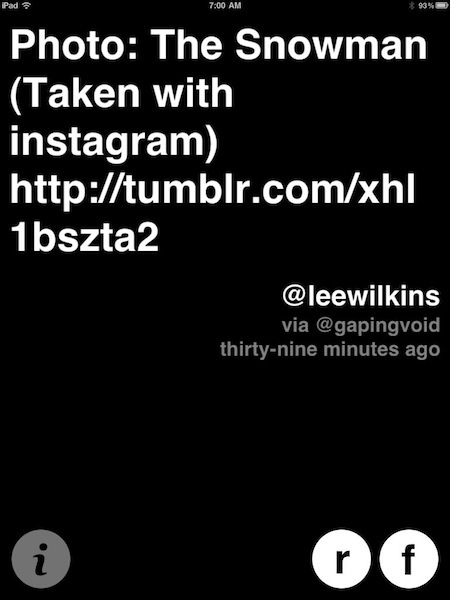 For what the app does, show your feed without the need to do anything, you shouldn’t be tapping on links. But, that would be a nice feature add in the future for those times you just can’t resist seeing where a link takes you.